In spite of strenuous efforts by the MPD staff, the J27 will not be steamed this week. There is still too much to do at the smokebox end and, although a fire could be lit now, it would serve no useful purpose and just cover everything in dirt and delay work even further. It is very disappointing news, but is in the best interests of getting the overhaul completed as quickly as we can. As it is, I have been assured that that first steaming will be done by the end of next week at the latest, provided no further problems arise - and I have been told that the J27 is fighting hard every inch of the way. However, contact is now being made with Glyn Coxhill, the boiler inspector, to get him booked in for the formal steam test as soon as he can after the initial one has been completed, so it cannot be too far away now! At the smokebox, the steam pipe welding has been completed, the NDT is due to be carried out next Wednesday to be followed by the hydraulic. The chimney has been fitted and centralised, but the blast pipe still needs adjusting to get it to sit square and central to the chimney. Some machining may be required, but that is still being measured and assessed. The smokebox door has now been adjusted to make it steam tight, and the smokebox number plate and 52G shed plate attached. The bottom of the smokebox wrapper has been prepared for painting on both sides so that the sandboxes can be fitted, and John Furness was painting them ready yesterday afternoon. The buffers have been retensioned and refitted. Down at the other end, the brick arch has gone in, but the ashpan spray still needs to be repositioned to get the damper doors to operate properly. The drawbar pins are to be replaced as the old ones are badly worn and bent. Various bits of pipework and the handrails need to be fitted, but the cladding is now all on, except for the two small pieces round the firebox which will need to be made new. The cab sides have been rubbed down ready for varnishing. 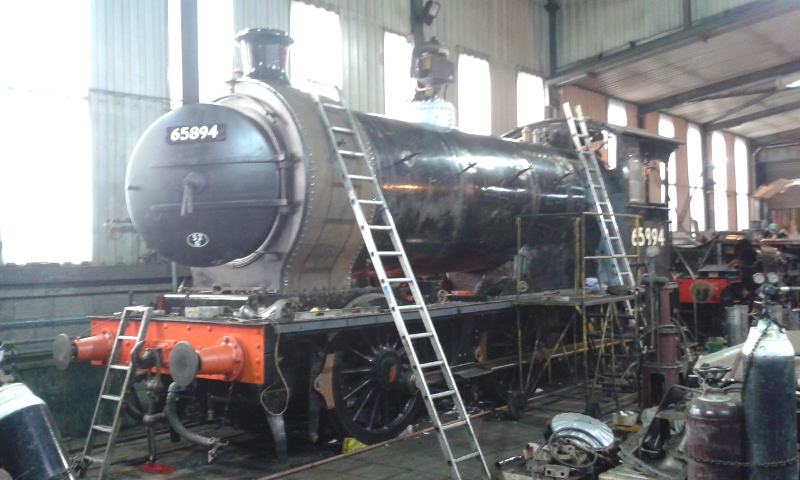 So it now looks more like a steam engine - see photo - but the tender is due to be brought down from Deviation Shed today or tomorrow to complete the picture. Mark O'Brien is away for the next few days with the B1 in Scotland on GBXI (various parts were passed on its way by road to Bowness yesterday), but work will continue by the fitters in his absence, with Barney and Piglet keeping an eye on progress.